Unless federal judge rules in plaintiffs’ favor, the requirement will kick thousands more low-income Arkansans off their health insurance. 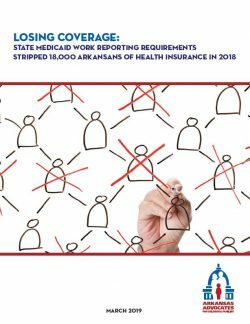 Our new, follow-up brief highlights the results of the Arkansas Works work-reporting requirement from June to December 2018 The results are unfortunately as expected under a deeply flawed policy: more than 18,000 Arkansans lost coverage last year, and thousands more will lose coverage next month. As we await the ruling by U.S. District Judge James E. Boasberg on the fate of Arkansas’s work reporting requirement, our analysis shows the requirements have done substantial harm to the Arkansas Medicaid expansion program. Of the more than 265,000 low-income Arkansans who have health insurance through Arkansas Works, around 18,000 people lost their health insurance in 2018 because they didn’t report working, or prove they didn’t have to work, for three months. Even if they were working or started working, they were ineligible get back on Arkansas Works until January 2019. Only 1,452 individuals who lost coverage in 2018 regained coverage as of January 2019. There is no data to show the remaining 16,600+ have health insurance through other means. One key finding is that the vast majority (71 percent to over 90 percent) of people required to report their activities were exempt from the actual work requirement. Thousands of Arkansans who aren’t required to work to be eligible for Medicaid are losing their coverage because they failed to report or report adequately their exemption. This points to a significant flaw in the design of the policy. Only two months into 2019, more than 13,000 Arkansas Works enrollees did not meet the work reporting requirement. On April 1, thousands more Arkansans will lose their health coverage and be locked out of the program until January 2020, unless the requirements are stopped. Arkansans relying on Arkansas Works face multiple barriers, both to working and to the monthly reporting requirement. The policy’s assumption appears to be that people should work so they can have health care. Reality, and data, tell us that people need health care so they can be healthy enough to work. Arkansas Advocates for Children and Families continues to recommend, at a minimum, pausing implementation of the policy until the evaluation plan is completed and until the state invests in stronger outreach. More data should be collected on the barriers that make it difficult for people to meet the requirement. If the rule proceeds on schedule and without changes, it will continue to threaten the progress we’ve made to improve access to coverage and care for every Arkansan. Download a copy of the report below.